I was wondering if anyone could help us. We have a 14 month old male dog that is totally housetrained. We recently moved to a new house. When we take him out for a walk he will pee and poop. However he has been peeing in the house after we come back. He has certain spots which he seems to like to pee. However he doesn't poop inside only pees. Does anyone have any suggestions as for what we should do???????? This is causing a lot of problems since it's "my" dog and my wife is not happy to say the least with the situation. This is probably because he is afraid and stressed of the new house. Dogs pee then sometimes in the new house to make it smell more familiar that they feel more relaxed there. 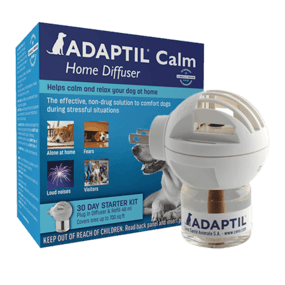 So he should deal with the stress: put some anti stress things in house (adaptil is great) but he should also first check if there isn’t any bladder infection. Also, may you should put the dog to some smaller places. Not that he had the whole house for him. That could also help him adapt more to the new situation. Thanks for the reply and advice!! So we took our dog to the vet and had him checked for a urinary tract infection, you're correct the vet told us this is always the first thing you should have checked. Our dog luckily didn't have any infection. The vet said it is most likely because he is a male dog and because it's a new space, he is marking his territory. He reccomended getting an enzyme spray to break down the urine in the areas where he urinated. That way he wouldnt smell it and pee there again. We are moving it closer and closer to the door every day and then soon will move it outdoors and in the backyard. And then we are going to take the pad away and leave the hydrant for him to use to mark on outdoors. We used this article to help us for the pee pad/hydrant method: A Dog Fire Hydrant Is Your Lawn's Best Friend It's working for us so hopefully it can help someone else who is having the same problem with a male dog. We are going to check out the product you suggested above that plugs into the wall as well since the vet told us that moving can be very stressful for dogs. Also it may help our dog since he very afraid whenever there is a thunder.